An elastomeric blended compound of various polymers and additives. 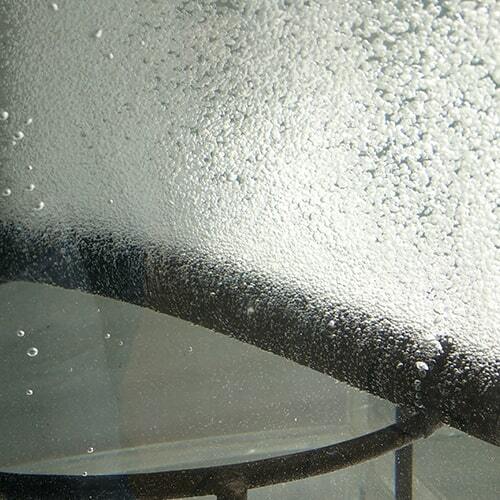 Bubble Diameter 1 to 2 mm depending on water depth, air pressure, water salinity, etc. Air Flow – Depends on blower size and output. At 2 PSI pressure and 1 mtr water head, Average flow rate per mtr is approximately 800 ltrs/ hour (0.8 m3 / hr). However since bursting is not a concern, the air flow can increase as high as required by increasing blower and motor size. This is not however useful for aeration purpose since the flow will be too high to have any meaningful dissolution of air. Bubble size – varies with depth of installation and blower pressure. At 1.5 mtr depth, bubble size at exit of tube is less than 1 mm, at a pressure of 2.0 PSI. However it will change depending on salinity, air flow from blower, pressure, water depth, etc. Air Flow – Depends on blower size and output. At 2 PSI pressure and 1 mtr water head, Average flow rate per mtr is approximately 500 ltrs/ hour (0.5 m3 / hr). However since bursting is not a concern, the air flow can increase as high as required by an increasing blower and motor size. This is not however useful for aeration purpose since the flow will be too high to have any meaningful dissolution of air. Bubble size – varies with depth of installation and blower pressure. At 1.5 mtr depth, bubble size at exit of tube is less than 1 mm, at a pressure of 2.0 PSI. However, it will change depending on salinity, air flow from blower, pressure, water depth, etc. Install at a height of at least 12” above floor of the pond. If it is PE lined pond then the tube can be installed at 6” above bottom.